A gong is is an East and Southeast Asian musical percussion instrument with a bowl-shaped, circular metal disc which is hit with a mallet ot thick padded stick. Gongs produce two distinct types of sound. 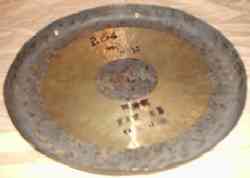 A gong with a flat surface gives a "crash" rather than a tuned note. In Indonesian gamelan ensembles, some gongs are made to give a beat note in the range from about 1 to 5 Hz. The use of the term "gong" for both these types of instrument is common. This page was last changed on 18 March 2019, at 15:32.